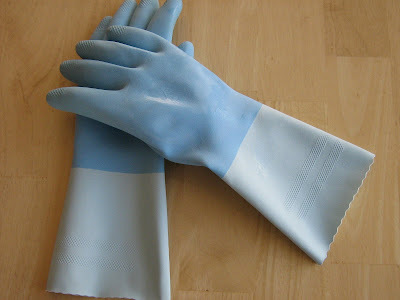 Embracing my weirdness, I will happily share my exciting new pair of rubber gloves. They make me smile every time I do the dishes and they are so pretty, I promised them they would never get demoted to toilet duty. And finally, I share the paint chips that I have been staring at for weeks, trying to decide just what shade to paint my bedroom. They all look the same in the picture but trust me, they are not and I keep going back and forth on what colour to pick. I can sort of see why my husband told me to paint the house whatever colour I wanted, just PLEASE don't show him any more paint samples. Very pretty...the gloves, the fabric and the paint chips. Looks like you can't go wrong with any of those colors, they are all so calming. Lovely gloves, makes a change from garish orange! And I think you should go for the blue in the large sample at the bottom - it looks like a periwinkle blue to me - I like that one! 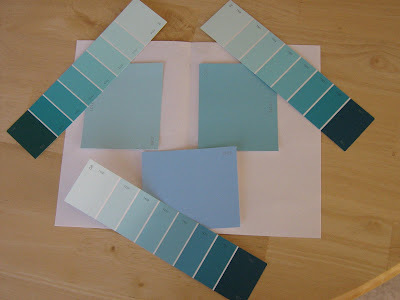 Ahhhhhh, love the colour blue, so of course I liked what you posted. 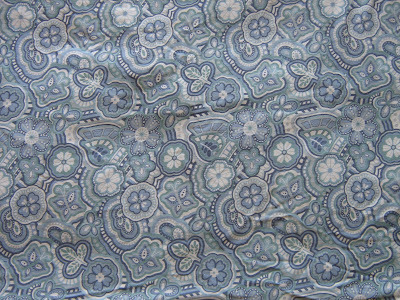 Can't wait to see the skirt you will make with this very lovely fabric! Could I torment you by saying that I like the large sample on the left just to be contrary? Nah, I wouldn't do that. I'm with Rob - no more paint samples. Maybe post them up on the wall and throw a dart to pick?